� � � �America Is In Trouble !! � � � � � � � � � � � � � �Exceptional America ? When President Obama, speaking at the 2014 West Point commencement, said, “I believe in American exceptionalism with every fiber of my being “ -� I wondered if we lived in the same country. I have come to realize that we ARE exceptional, but for all the wrong reasons. highest poverty rate, both generally and for children. lowest government spending on social programs for the disadvantaged. lowest number of days for paid holiday, annual leaves and maternity leaves. worst score on the United Nations gender inequality index. highest public/private expenditures on health care as percentage of GDP. highest proportion of population without health care due to cost. second lowest birth-weight for children per capita, behind only Japan. highest consumption of antidepressants per capita. third shortest life expectancy at birth, behind Denmark and Portugal. highest CO2 emissions and water consumption per capita. highest rate of failure to ratify international agreements. lowest spending on development and humanitarian assistance. highest military spending as a portion of GDP. third-lowest scores for student performance in math. second-highest high school dropout rate, behind only Spain. largest prison population per capita, more than China and China has 4 times the population. If you are not already reading the news from Progressive sites please consider doing so. If you are, share them with�others. Excellent news resources can be found on the Library page. Visit it often. Tell others. � � � � � � � � � � � � � � ��How much is a trillion dollars? Any idea how much money that is? Stacked flat, the same amount will make a pile 57,429 miles high, or more than twice the length of the Earth’s equator. � � � � � � ��What else could we get for $1.14 trillion? Place it on $5,000 worth of land. Furnish it with $10,000 worth of furniture. Put a $10,000 car in the garage. And give all this to every family in Kansas, Missouri, Nebraska, Oklahoma, Colorado, and Iowa. Having done this, you would still have enough money left to build a $10 million hospital and a $10 million library in�each of 250 cities and towns throughout the six-state region. Pay a salary of $25,000 per year for 10,000 nurses. Pay a salary of $25,000 per year for 10,000 teachers. Give an annual cash allowance of $5,000 for each and every family throughout the six-state region - forever. The following is a list of prominent foreign individuals whose assassination (or planning for same) the United States has�been involved in since the end of the Second World War. �1949 - Kim Koo, Korean opposition leader. 1950s - CIA/ Neo-Nazi hit-list of numerous political figures in West Germany. 1950s - Cho En-lai, Prime Minister of China, several attempts on his life. 1950s��1962 - Sukarno, President of Indonesia. 1951 - Kim ll Sung, Premier of North Korea. 1953 - Mohammed Mossadegh, Prime Minister of iran. 1950s - Claro M. Recto, Philippines opposition leader. 1955 - Jawaharla lNehru, Prime Minister of India. 1957 - Gamal Abdul Nasser, President of Egypt. 1959, 1963, 1969 - Norodom Sihanouk, leader of Cambodia. 1960 - Brig. Gen. Abdul Karim Kassem, leader of Iraq. 1950s - 1970s - Jose Figueres, President of Costa Rica, 2 attempts on his life. 1961 - Francois “Papa Doc” Duvalier, leader of Haiti. 1961 - Patrice Lumumba, Prime Minister of the Congo (Zaire). 1961 - Gen. Rafael Trujillo, leader of the Dominican Republic. 1963 - Ngo Dinh Diem, President of South Vietnam. 1960s - Fidel Castro, President of Cuba, many attempts on his life. 1960s - Raul Castro, high govt. official of Cuba. 1963 - Francisco Camano - Dominican Republic opposition leader. 1965-66 - Charles de Gaulle, President of France. 1967 - Che Guevara, Latin American revolutionary. 1970 - Salvador Allende, President of Chile. 1970 - Gen. Rene Schneider, Commander-in-Chief of the Army, Chile. 1970s, 1981 - Gen. Omar Torrijos, leader of Panama. 1972 - Gen. Manuel Noriega, Chief of Panamanian Intelligence. 1975 - Mobutu Sese Seko, President of Zaire. 1976 - Michael Manley, Prime Minister of Jamaica. 1980-86 - Muammar Qaddafi, leader of Libya, several attempts on his life. 1982 - Ayatollah Khomeini, leader of Iran. 1983 - Gen. Ahmed Diimi, Moroccan Army commander. 1983 - Miguel de’Escoto, Foreign Minister of Nicaragua. 1984 - The 9 commandantes of the Sandinista National Directorate. 1985 - Sheikh Mohammed Hussein Fadallah, Lebanese Shiite leader. 1991 - Saddam Hussein, leader of Iraq. 1986 -� Libya: Bombing, naval air strikes to topple govt. 1992 -� Troops deployed, anti-police uprising, L.A.
�The following were trained at the School of the Americas and we paid their tuition. General Raoul Cedras - Dictator of Haiti, ousted 1994. General Hugo Banzer - Dictator of Bolivia from 1971 - 78. Manuel Noriega - Drug runner and dictator of Panama. �Colonel Roberto D’Aubuisson - Dictator of El Salvador and a death-squad leader who carried out the assassination�of Archbishop Oscar Romero of El Salvador in 1980. �The soldiers who raped and murdered the American nuns in El Salvador in 1980. Colonel Francisco Elena Fuentes - With 19 soldiers he killed 6 Jesuit �priests, their housekeeper and her teenage�daughter in San Salvador in 1989. �A colonel charged in the 1998 killing of Guatemala's Bishop Gerardi. �Colonel Juan Alpirez - A CIA-paid operative who was found responsible for the slayings of an American citizen and a Guatemalan rebel leder. �General Juan Lopez Ortiz - Led a massacre on unarmed peasants in Chiapas, Mexico. �8 of 12 officers - El Mozote massacre where over 1,000 unarmed civilians - including women and children - were murdered. �Hector Gramalo - Former Defense Minister of Guatemala, accused of torture and war crimes against Guatemalan people. �Major Joseph-Michel Francois - Chief of police in Haiti, played a key role in the coup that ousted democratically elected President Jean-Bertrand Aristide. � � � � � � � � � � � � � � How fair is America? Today, the top .001% of the U.S. population owns 976 times more than the entire bottom 90%. Half of all American children will be dependent upon food stamps at some point during their childhood. Half of America has 2.5% of the wealth. Real average earnings have not increased in 50 years. Despite the myth of social mobility, poor Americans have a SLIM CHANCE of rising to the upper middle class. One fourth of the country’s largest corporations - including General Electric, ExxonMobil and Bank of America -paid NO federal income taxes in 2010. This goes on while President Obama cuts home heating aid in half. Corporate taxes used to account for 30% of revenue collected by the government - today that number is 7%. 20 Facts About U.S. Inequality that Everyone Should Know. Press here. See the video, The American Dream by The Provocateur Network. Press here. � � � � � � � � � � � � Freedom and Democracy? Guatemala - A CIA-led coup removed the democratically elected government in 1954. U.S. supported and trained dictators ruled Guatemala with the widespread use of death-squads, torture, murder, abduction, and imprisonment. When Guatemala's 35 year civil war finally ended 160,000 were dead and 40,000 were "disappeared" - 93% at the hands of the Guatemalan security forces. Chile - A CIA-led coup murdered Salvador Allende, the democratically elected president in 1973. General Agusto Pinochet, the newly installed leader of Chile, led a reign of terror with assassinations, disappearances, abductions, torture, and far-reaching death squads. It has recently come to light how much support Pinochet received from the Nixon Administration, particularly from Henry Kissinger. There is evidence that the head of the Chilean secret police (DINA) was on the CIA payroll. Panama - The Panama story is a familiar one. Manuel Noriega, a criminal and graduate of the School of the Americas had been a cohort of�Panamanian president Torrijos and U.S. intelligence. Noriega became president when Torrijos was killed in a suspicious plane crash and remained Washington's friend until he began to act mildly independent and worried his masters to the north. Economic sanctions followed by a coup attempt failed to dislodge him. Panama was invaded in December 1989 by U.S. military forces and thousands of Panamanians paid with their lives. Noriega was arrested and sentenced to a federal prison in the United States. El Salvador - Our murderous behavior was stepped up in El Salvador. When peasant, labor and church groups began organizing in the 70s to help the poor the Salvadoran military and death-squads marched in violent obedience to their�paymasters and trainers in Washngton. The result was a bloodbath largely ignored by the mainstream American press. Tens of thousands of mostly poor civilians were murdered, and more than a million turned into refugees. As in most Latin American nations the assassins and torturers were trained at the School of the Americas. Nicaragua - When U.S. supported dictator Anastasio Somoza was ousted by the Sandanistas in 1979 the United States was not happy with the results. The new government was a bad role model for U.S. interests in the area. The Sandanistas fed the hungry, rebuilt infrastructure, began literacy and health programs for the poor, and didn't seem very corrupt - certainly not the clients we wanted in the region. Presidents Carter and Reagan pushed through economic sanctions, trained Somoza's former national guard troops into the contras, spread lies, mined a Nicaraguan harbor and pressured other nations to withdraw support. The contras, funded by drug sales, spread terror and death throughout the land, but despite huge amounts of money from the U.S. they never succeeded in overthrowing the Sandanistas or garnering much support from the people of Nicaragua. Nicaragua remains a broken and very poor�country. Colombia - Another government with a death-squad problem, Colombia has been receiving billions in U.S. aid. Colombia is knee-deep in a long-running civil war where drug profits fund all the parties involved. Caught in the middle are the people of Colombia who long for peace. The U.S. is pushing Plan Colombia, a poorly disguised attempt to crush the two groups of leftist rebels. The U.S. claims to be only interested in stemming the flow of drugs, but shows little interest in intercepting the profits of the paramilitary groups. Peru - When Alberto Fujimori, the president of Peru,�dissolved�the parliament, suspended the constitution, issued fascist decrees, dismissed 75% of the judges, promoted murderous attacks in villages throughout the country and arrested hundreds of opponents the U.S. was delighted - Fujimori was our man in Peru. The CIA funneled millions of dollars to Fujimori's closest "advisor", a shadowy and corrupt character named Valdimiro Montesinos despite his ties to drug�traffickers and death squads. This chapter in Peru's history ends with Montesinos being caught on video bribing a legislator and Fujimori fleeing to Japan. Haiti - We would support the Devil himself if he was good for business, and in Haiti we came close to such an agreement. After years of the U.S.-supported Duvalier family of dictators democracy began to�blossom when Jean-Bertrand Aristide, a leftist priest, won in a landslide in Haiti's first democratic election in 1990. Less than two years later Aristide was forced out of office in a CIA-supported military coup. The torture, death-squads, and terror of the Duvalier era returned. It was only after international pressure and an armada of Haitian boat people fleeing their homeland that the Clinton administration sent in troops to undo the injustice. Aristide's return was conditioned on the adoption of a structural adjustment program that aided investors, but hurt the poor. Haiti has recently slipped back into a dictatorship with the U.S. government's help. The Haitian people bravely struggle to survive after an earthquakes, hurricanes, and extreme poverty. Iraq - Iraq is a broken, corrupt, dangerous, undemocratic and miserable place now and a good example of what happens when our client thugs step out of line. Hussein murdered his own people and we didn't really care. When he stepped too far out of line we lied to the world about what a threat he had become so that we could attack Iraq. More tonnage of bombs fell in the 42 days of the first Gulf War than in the 45 months of World War II. Crippling sanctions killed more than one million Iraqis, most of them children. 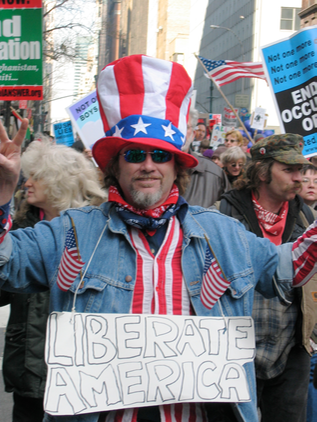 Millions demonstrated against the second Gulf War, but George W. Bush attacked anyway. Hundreds of thousands died and millions were displaced - all from a lie. Nearly 5,000 American troops died, many of them believing that it was all for freedom. "Meet the new boss, same as the old boss." Iraq's new government is remarkably similar to Iraq's old government. The lies continue. Israel and Palestine - In direct violation of international law Israel is occupying Palestinian land, curbing civil rights, using death-squads and torture, building illegal settlements, and the United States is making all of this possible by giving Israel enormous amounts of foreign aid, weapons, and diplomatic support. When Iraq illegally occupied Kuwait we invaded. When Israel does the same in Lebanon and Palestinian land we send them cash. The mainstream press in this country has done an excellent job of portraying the Palestinians as terrorists and the Israelis as the democratic defenders of their homeland. The Palestinian's struggle continue as their land is stolen and they are attacked by Israel's U.S.-supported military. Indonesia - In 1965 General Suharto of Indonesia ousted the legally elected government in a coup and masterminded the killing of what Amnesty International estimated to be more than one half-million Indonesians, mostly landless peasants, ethnic Chinese and trade unionists. U.S. State Department documents from that period clearly indicate that the CIA provided "hit lists" to the Indonesian security forces. Ten years later Suharto invaded and annexed East Timor, a former Belgian colony, and slaughtered one-third of its residents. Presidents Ford and Carter not only didn't condemn this practice, but supplied arms and tactical support. In the late nineties Suharto's greed and corruption was even too much for his American supporters and he was cut loose and ousted from power. President Obama recently re-continued military aid to some of Indonesia's more thug-like military units. Illegally and brutally applied force against: Vietnam, Laos, Cambodia, The Philippines, Grenada, Afghanistan, Iran, Syria, Argentina, Mexico, Lebanon, Cuba, Brazil, Saudi Arabia, Honduras, Dominican Republic, British Guiana, Congo, Sudan, Yugoslavia, Ghana, Egypt, Uruguay, Costa Rica, Australia, Zaire, Angola, Morocco, Libya, Albania, Ecuador, Algeria, Bolivia, Jamaica, Somalia, Yemen, Bahrain, Suriname, and Pakistan.